In the first few weeks of moving to Berlin I found myself locked out one Thursday evening, not wanting to trouble my new flat mates I decided to take a stroll around my new area. After five minutes of strolling my fingers were as blue as a smurf and my nose as red as rudolf (it was January and snowing heavily), but then, up ahead in the distance, I saw a shimmering light, my head grew heavy and my sight grew dim … alas it was not Hotel California but Cafe Nostalgia, I had to stop for a drink. This is perhaps one of the most authentic ‘locals’ I have found in Berlin. Not a hint of English here so maybe brush up on your German before you arrive ( though ein großes Bier bitte is all you need ). The older Schöneberg crowd perch themselves around the bar and scattered high tables chatting, smoking and drinking. 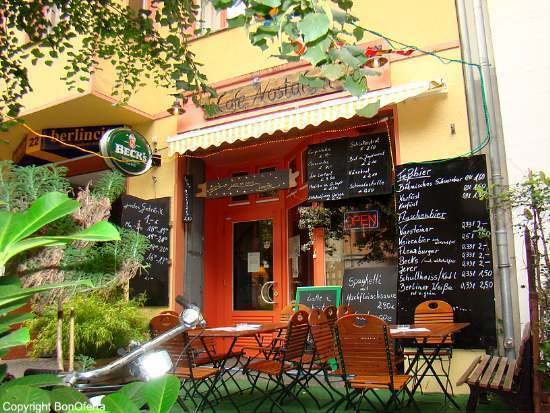 They are friendly but not particularly sociable with newbies, but this can make for a welcome change in Berlin if you’re looking for a little alone time. The walls are crowded with a seemingly random mix of artefacts, a darts board and local nostalgia which add to the personal and local atmosphere. It is a smokers pub and it’s not big so if you’re not keen on smokey places then i’d advise coming in the summer when you can sit outside. There is a small but good value menu served during the day – cold plates and goulash mostly – and of course cheap drinks are served until closing (around midnight). Happy hour changes regularly but is usually some time between 18:00 and 21:00, check the website for up to date times. Easily missable but definitely worth a visit, this tiny little ‘Raucher Kniepe’ (smoking pub) is only really noticeable at night when it stands out like a red glow worm in the otherwise residential street.